This Saturday 23 April is the 400th anniversary of Shakespeare’s death and the place to be is the Thames Path in London. 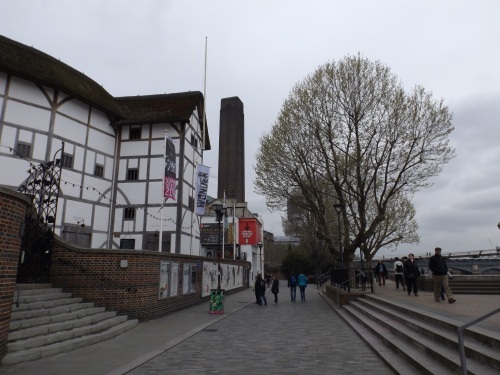 Next to the river on Bankside there is the Shakespeare’s Globe theatre and Southwark Cathedral where Shakespeare’s brother Edmund is buried between the choir stalls. Over the weekend there will be 37 screens on the Thames Path between Potters Fields and Jubilee Gardens showing Shakespeare’s plays filmed where he imagined them. The Duke of Edinburgh, a long supporter of the Globe rebuilding, will be at the cathedral at 11am on Saturday for a special service. All tickets have gone but the cathedral will be open in the afternoon for viewing of the flowers at the memorial where the Shakespeare effigy holds rosemary ‘for remembrance’. In the cathedral at 2.30pm Arthur Smith reveals the truth about Shakespeare’s first publishers and Jane and Rick Jones perform lute songs from the plays; admission free.